Here's another simple tip that until now has yet to make it to print. As you can see this clamp is bolted to the lower front head bolt hole, and has a 3/8-16th steel nut welded to it. 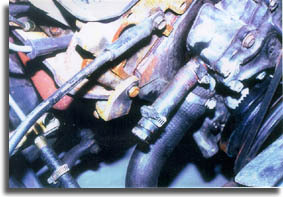 The nut is positioned so as to place the bolt that you're going to tighten through it at the edge of the header flange. Make one for each corner. Simply use thick enough material to hold the bolt. No more leaks.